Don Lincoln is a senior scientist at the U.S. Department of Energy's Fermilab, America's largest Large Hadron Collider research institution. He also writes about science for the public, including his recent "The Large Hadron Collider: The Extraordinary Story of the Higgs Boson and Other Things That Will Blow Your Mind" (Johns Hopkins University Press, 2014). You can follow him on Facebook. Lincoln contributed this article to Space.com's Expert Voices: Op-Ed & Insights. November marks the beginning of the holiday season, but this year, there's even more reason to throw a party: It's the 100th birthday of Einstein's theory of general relativity. Forget the turkey this year — we science enthusiasts can instead celebrate the invention of a paradigm that completely overthrew our fundamental understanding of the very meaning of space and time. In November 1915, Albert Einstein published four papers — each separated by a week, followed by a summary paper in March 1916 — in which he laid out his theory of general relativity and blew humanity's collective mind. Einstein's earlier theory of special relativity (1905) was already confusing enough, because of how it inextricably linked space and time. But at least in that theory, space was comfortably familiar to people who had learned Euclidean geometry: Parallel lines never crossed, the sum of the angles of a triangle was 180 degrees and space was flat. Special relativity might have taken a little work to understand — but Einstein's general relativity was, well, twisted. The new theory showed a changing and dynamic space-time that was tied to the energy and mass density of the universe. Space itself could be bent and warped by the presence of matter. This new vision of the universe was not immediately accepted. It wasn't until 1919 that the scientific community embraced the idea, when Sir Arthur Eddington's naval expedition to the then-Portuguese island of Príncipe showed that the sun bent the path of light emitted by distant stars passing near it. The day after Eddington's Nov. 6 presentation to the Royal Society, Einstein and his theory were instant scientific rock stars, trumpeted worldwide on the front page of major newspapers. Even prior to the hubbub of 1919, scientists were exploring the consequences of the proposed new paradigm. In one of his papers of 1915, Einstein had compared classical Newtonian gravity and his own theory, and found differences in how they predicted the precession of the orbit of Mercury. While both calculations predicted a precession, the theory of general relativity agreed with data, while Newton's did not. Another early explorer of the consequences of Einstein's idea was Karl Schwarzschild. Already a well-respected scientist, Schwarzschild joined the German army during World War I. While in the trenches on the Russian Front, he contracted a rare autoimmune skin disease, from which he eventually died. Sent home with the intent that he convalesce, Schwarzschild returned to his love of science. Within a month of the flurry of papers in 1915, he explored the consequences of Einstein's theory. As he lay in his bed, afflicted by painful sores, Schwarzschild worked out a solution to the new equations for an extreme bending of space, which we now call a black hole. In this centennial of Einstein's successful year, we can now look back and see the impact of general relativity on how we understand the universe. In contrast to the halting acceptance of a century ago, the scientific community has now firmly embraced the idea, which has a range of testable consequences. One such prediction is relevant to our modern life. Einstein predicted that, in addition to the familiar (and nonintuitive!) changes in space and time that occur when one approaches the speed of light, the passage of time also depends on the strength of the gravitational field. This implies that clocks that experience stronger gravity tick more slowly than those in a weaker gravitational environment. This prediction was first tested in 1971, when Joseph C. Hafele of Washington University in St. Louis and Richard E. Keating of the United States Naval Observatory flew four very precise atomic clocks around the world and compared them to clocks left stationary in their laboratory. When the clocks were reunited, they reported a different elapsed time, in exact agreement with the predictions of general relativity. Modern relativity skeptics love to dispute the Hafele-Keating measurement, but the experiment has been repeated many times over the past 44 years. In fact, modern strontium clocks built by JILA — a joint institute of the University of Colorado, Boulder, and the National Institute of Standards and Technology — are so precise that they can measure a shift in time if one clock is lifted a mere 2 centimeters (less than an inch) higher than its twin. More practically, general relativity has a real implication for the GPS system built into your phone. Because the system works by comparing both orbiting and Earth-bound clocks, the fact that the clocks in satellites tick more quickly than their terrestrial cousins must be taken into account. If general relativity were not accounted for, the difference in the clocks would lead the GPS system to tell you that you were in the wrong place. And the effect isn't small. Each day, the offset would be about 6 miles (10 kilometers)! Very quickly, the GPS system would be totally useless. Another triumph of Einstein's theory of general relativity employs the same technique as Eddington's measurement of the deflection of light by distant stars. 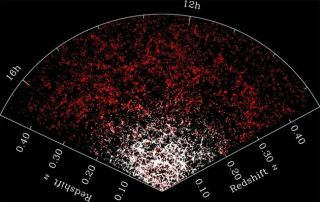 By using improved versions of the same methods, scientists can use distortions of distant galaxies to literally measure the mass of the universe. There is one prediction of general relativity that has not yet been confirmed directly. If mass can distort space, then moving mass can set up vibrations of space — what scientists call gravitational waves. In 1974, Russell A. Hulse and Joseph H. Taylor Jr. of the University of Massachusetts Amherst discovered a binary pulsar. A pulsar is a rapidly rotating neutron star that emits regular radio signals. In the case of Hulse and Taylor, the pulsar was co-orbiting another very dense stellar object. By watching the binary system, they saw that the orbital period was decreasing very slowly over the years — specifically, 75 millionths of a second per year. This decline is thought to be caused by the loss of energy by gravitational radiation. The observation is persuasive enough for the two men to have been awarded the 1993 Nobel Prize in physics, but it would be valuable to directly observe gravitational waves. A series of experiments conducted here on Earth employing a range of technologies are underway. With these experiments, scientists hope to observe these gravitational ripples as they pass over the planet. These waves are thought to be created in extremely violent astronomical events, like the merging of two black holes. When observed, the achievement will be a crowning confirmation of Einstein's theory. There is absolutely no question that Einstein's theory of general relativity is one of the most impressive intellectual achievements of all time. Our familiar understanding of space and time were shown to be quite wrong. Space can bend and twist under the influence of matter. Mass and energy are inextricably intertwined with the shape of space and time. It is, indeed, Einstein's greatest triumph.